Come enjoy this redone Mid-Century, located on a quiet residential street that backs onto the Tahquitz Creek "Legends" golf course. The house boasts a large open living space with lots of room for your group to spread out, maybe play some pool, a board game or just relax. It features comfortable, stylish furnishings throughout with dining seating for 8. There are 3 bedrooms with a bonus flex room off the master suite.. Maximum occupancy is 6 adults ( and 2 children under 12) however the maximum number of adults is 6 ... the combination of 8 cannot exceed 6 adults. The master suite is situated on one side of the house with private patio access to the pool. There is a King size bed with Premium bedding. Adjacent to the master bath is the flex room which is set up as an office. It has a double hide-a-bed, perfect for those who want their young children close by or simply a comfortable room for those extra guests who don't want to share a bed. There are 2 large guest rooms located on the other side of the house each with a queen size bed and premium bedding. Start off the day lounging by the pool watching the golfers go by or admiring the gorgeous view of the mountains. After a long hot day kick back at the Palapa bar where you can whip up a cocktail or BBQ a feast. While we want everyone to have fun and use all our house has to offer we do ask that you show some respect as this is our families house and not just a vacation rental. We look forward to being able to share our house with you! There is an additional fee of $30/day minimum of 2 days if you would like the pool heated between the months of October thru April. We need a minimum of 36 hours notice if you would like the pool heated. Hi, we are a family from beautiful Vancouver B.C that happens to have a daughter who has transplanted herself to the gorgeous Coachella Valley. Making Palm Springs our second home was one of the easiest decisions ever.... we are a family that loves many outdoor pursuits ranging from photography, biking, camping to golf. Where else has guaranteed sunshine , endless outdoor activities, stunning views, and great food ? We hope you end up loving it as much as we do. sitting area with board games/ poker chips etc. Perfect for a few couples, golfers getaway or a friends/ family gettogether. The bungalow had everything we needed for a very nice stay. The location was very convenient. I would definitely recommend it. Well worth it and perfect vibes! We were surprised how spacious this home was, had a great open feel, decorated beautifully, gorgeous views from the backyard, and super comfortable beds! What a great time! Even though Palm Springs proved chillier than we had hoped for in February, we had a blast at the Brentwood Bungalow! Our kids had a ton of fun in the heated pool and playing pool! The house is very clean and modern inside and the kitchen is well stocked! Great location with stores, golf, and everything else needed nearby. Dawn was very responsive to all questions leading up to our vacation and Ashley was also on top of our arrival and checkout. Thanks! We loved our stay in this home. Plenty of space to enjoy hanging out with friends. Bedrooms are very nice size with comfortable beds. Very nice accommodations all the way around. Owner was very pleasant from start to finish and was quick to respond with any questions or concerns. Would love to stay here again. You guys were GREAT! Sorry the weather wasn’t the best :(. We would love to have you and your friends stay again if you find yourself back in Palm Springs. 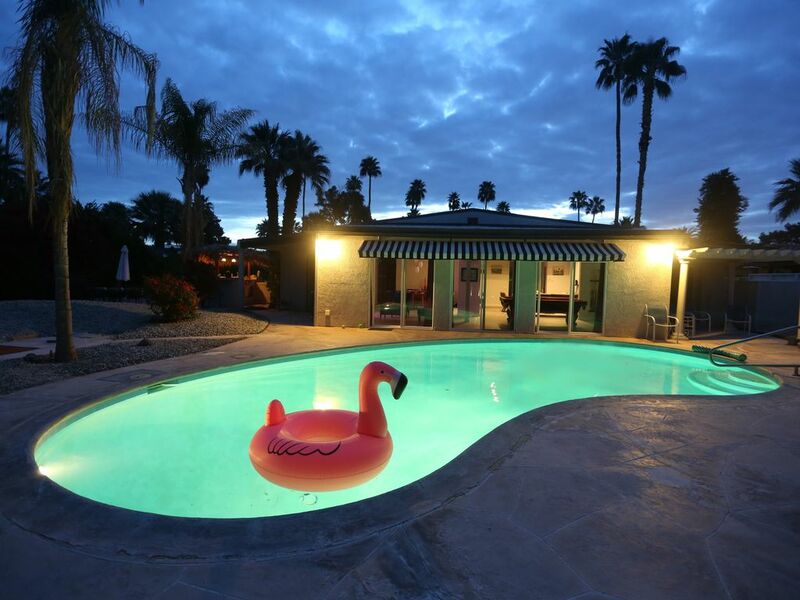 This property was perfect for our 5 member family to stay while in Palm Springs for a wedding! We were given the wrong combination for the lock box but one quick call to Ashley and problem solved! Ashley was also very accomodating, letting us stay a few more hours due to our late flight out. The property itself had everything needed to make our stay wonderful! The view of the mountains from the back yard is beautiful! We enjoyed time in the pool and mornings drinking coffee outside, enjoying the spectacular mountain view as well as the trees and flowering bushes and listening to the birds sing. The kitchen had everything we needed and the common area seating is plenty and comfortable. The bedrooms and bathrooms are comfortable and spacious. We hope to have an occasion to return soon! Ashley and the owners are very helpful and thoughtful! We feel very fortunate to have found this property! We are glad you had a great stay, sorry about the oops with the combination 😬 I will have to speak to our property manager about that.. AkA our daughter Ashley, glad it was rectified quickly. It is pretty amazing listening to the birds singing in the morning, something we totally enjoy as well. We would love to have you back if you find yourself in the desert again. MAXIMUM 2 Week Rental in most cases... please contact us if you are interested in staying longer $25/ day heating will be charged in addition if you want the pool heated during the months of October thru April .. Please advise ahead if you would like this. Mid stay house cleanings can be arranged for you.